Lighttpd is a lightweight, open-source web server optimized for high speed environments while keeping resource usage low. It is an excellent alternative to the commonly used web servers Nginx and Apache. In this guide, we will install and configure Lighttpd on a server running FreeBSD 11.0. We also add MySQL and PHP to our new Lighttpd web server so we can serve web applications as well as static content. To complete this guide you'll need one physical or virtual machine running FreeBSD 11.0 including a user account configured to run commands with sudo privileges. There are a couple options for installing Lighttpd, but in this guide, we'll use packages for installation. This method is faster than installing from source or via Ports, and software installed with this method is easy to update. Confirm the installation by typing y. Lighttpd will install. Then save the file and exit the editor. MySQL is a database management system that will allow the creation of databases for the PHP applications you plan to host on your Lighttpd web server. You'll install MySQL via its package, just like you did for Lighttpd. Then you'll set up a password for the MySQL root user and disable some other testing options. This ensures you'll have a secure MySQL setup. Confirm the installation by pressing: y. Warning: Enabling this feature is something of a judgment call. If enabled, passwords which don't match the specified criteria will be rejected by MySQL with an error. This will cause issues if you use a weak password in conjunction with software which automatically configures MySQL user credentials. It is safe to leave validation disabled, but you should always use strong, unique passwords for database credentials. Answer Y for yes, or anything else to continue without enabling. If you choose to enable this feature, you'll be asked to select a level of password validation. Keep in mind that if you enter 2, for the strongest level, you will receive errors when attempting to set any password which does not contain numbers, upper and lowercase letters, and special characters, or which is based on common dictionary words. Press Y to change this password. If you enabled password validation, you'll be shown a password strength for the existing root password, and asked you if you want to change that password. Press Y to continue with the new password. For the rest of the questions, you should press Y and hit the Enter key at each prompt. This will remove some anonymous users and the test database, disable remote root logins, and load these new rules so that MySQL immediately respects the changes we have made. Once the MySQL instance is up and running, we can install and configure PHP. PHP is the component of our setup that will process code to display dynamic content. It can run scripts, connect to our MySQL databases to get information, and hand the processed content over to our web server to display. Lighttpd does not contain native PHP processing like some other web servers, so we'll use PHP-FPM, which stands for "FastCGI Process Manager". 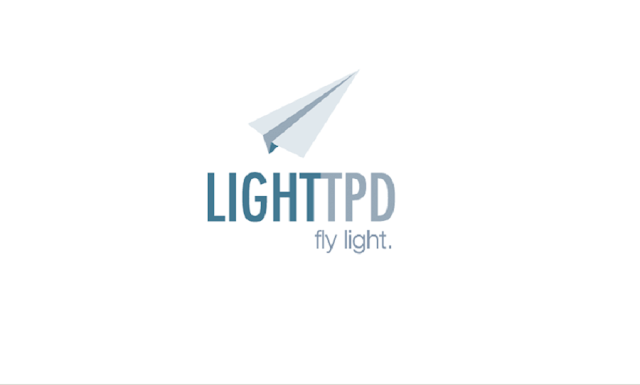 We'll configure Lighttpd to use this module to process PHP requests. Before we do that, we need to configure PHP-FPM itself. We'll configure PHP-FPM to use a Unix socket instead of a network port for communication. This is more secure for services communicating within a single server. Uncomment this line and set the value to 0. This prevents PHP from trying to execute parts of the path if the file that was passed into process is not found. This could be used by an attacker to execute malicious code. Next, let's configure Lighttpd to serve PHP applications. 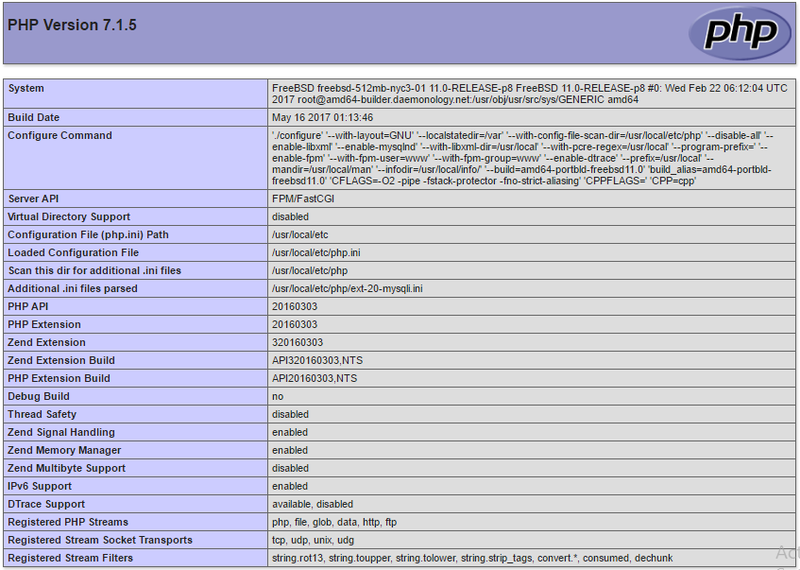 In this step you will configure Lighttpd to use FastCGI and PHP-FPM. This will enable PHP on Lighttpd and give fast and efficient PHP support. Uncomment the include line by removing the # symbol. If you don't find that line, add it to the end of the file. Now that PHP is ready to go, let's make sure everything works. To test the newly configured Lighttpd server, first create the folder /usr/local/www/data, which is where Lighttpd will look for web pages to serve. This page shows information about your operating system, web server, and how your web server handles PHP files. It also verifies that your web server can serve PHP files correctly. If you don't see this page, and instead see Error 503 Service Not Available, ensure that the php-fpm service started correctly in the previous step. The web server is now fully configured and ready to go. Place your files in /usr/local/www/data to serve them. Now that the Lighttpd web server is fully up and running, you can host webpages, documents, and other files on your web server. To make your web server more secure by adding SSL configuration and other security features.